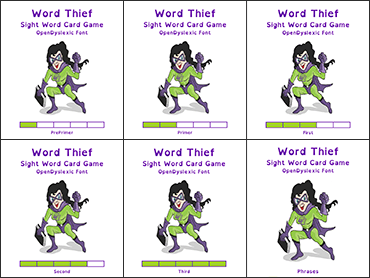 Motivate your reluctant readers with Word Nerd Card Games—ten fun, engaging card games that help students master the essential high-frequency words (Dolch/Fry) that account for up to 75% of the words they read. Becoming automatic with these words is a critical component of attaining fluency. The Word Nerd games—inspired by old favorites like Crazy Eights and Go Fish—can be used anywhere, anytime, by teachers and parents alike. These games are easy to implement, easy to customize for differentiated practice, and a perfect support to the Common Core Standards and research-based reading programs. The words on the cards are printed in the OpenDyslexic font, a special font designed to increase readability and reduce letter confusion for readers with dyslexia. ​ Not sure which Word Thief level to choose? Starting with the pre-primer list, ask the student to read each word aloud. Mark a word as correct if the student is able to read it accurately in three seconds or less. Start the student at a level where he or she knows at least 30 of the words. Players accumulate cards by saying the sight words on the cards they turn over. But watch out! The Word Thief could steal the words they've earned! Includes six decks, one each for the preprimer, primer, first, second, third, and phrases levels. Players accumulate cards by saying the sight words on the cards they turn over. But watch out! The Word Thief could steal the words they've earned! This is the PrePrimer level, one of six levels available. 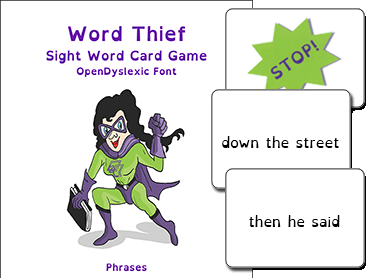 Players accumulate cards by saying the sight words on the cards they turn over. But watch out! The Word Thief could steal the words they've earned! This is the primer level, one of six levels available. Players accumulate cards by saying the sight words on the cards they turn over. But watch out! The Word Thief could steal the words they've earned! This is the first level, one of six levels available. 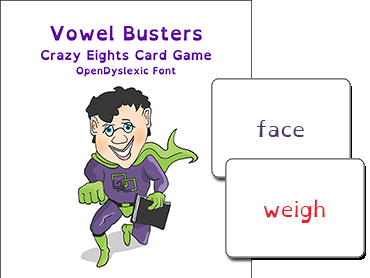 Players accumulate cards by saying the sight words on the cards they turn over. But watch out! The Word Thief could steal the words they've earned! This is the second level, one of six levels available. Players accumulate cards by saying the sight words on the cards they turn over. But watch out! The Word Thief could steal the words they've earned! This is the third level, one of six levels available. Players accumulate cards by saying the phrases on the cards they turn over. But watch out! The Word Thief could steal the phrases they've earned! This is the phrases level, one of six levels available. 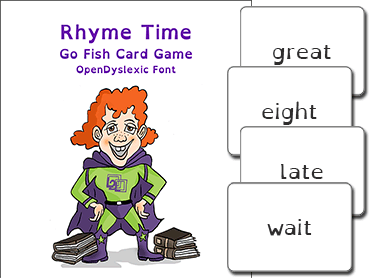 Rhyme Time is similar to Go Fish. Players try to collect sets of four cards with words that rhyme.